Fabio Leonardi produces some of the finest tomato milling machines, meat grinders and other household or commercial kitchen appliances. "We know Fabio Leonardi, we ARE FabioLeonardiUSA." Fabio Leonardi produces some of the finest tomato milling machines, meat grinders and other household or commercial kitchen appliances. FabioLeonardiUSA.com has the rare and unique opportunity to be the sole distributor in the United States for this historic Italian brand. We carry a large stock in our US warehouses and bring the products direct to American customers. 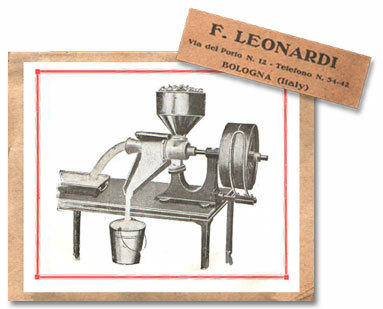 Fabio Leonardi made the first tomato crusher in 1917. For over 80 years this practical, economical, safe and durable utensil has been distributed not just in Italy but all over the world and used to obtain the finest quality in tomato sauce, fruit juices, vegetable juices, and purees. The models now produced by Leonardi recall this long tradition united with the improvements developed during the years that made those machines more functional and durable, with the natural evolution of the design. In the Leonardi production there are also meat grinders for small and medium kitchens, sacker machines, kneading machines and other accessories all connectable to the motors made by Leonardi. This Company,in "Via del Porto",was maintained until the second world war when, during the bombings of Bologna, the building was partially destroyed. The industries were in fact considered strategic during the war and thus were targets of bombing. 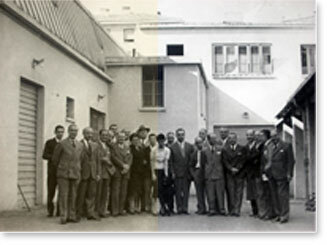 At the end of the war the company was reopened and continued business, expanding to include other products: they purchased from England the patents for the manual meat grinder Elect series, which together with the tomato milling machines are still their main products, but they also offer choppers, ice crushers, graters, etc.